The Vermont Real Estate Broker Exam is split into two parts. The first part is the real estate broker national exam and the second part is the real estate broker state specific exam. 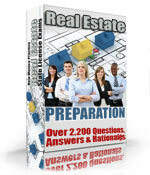 The national portion of the Vermont Real Estate broker exam is comprised of 80 questions. In order to pass the exam an examinee must answer 60 out of the 80 questions correctly. The time limit allowed to complete the national and state portions combined is 240 minutes. The state specific part of the Vermont Real Estate Broker Exam is comprised of 40 questions and an examinee must answer 30 questions correctly to pass. The time limit allowed for both parts of the Vermont Real Estate Broker Exam is 240 minutes. In Vermont if you pass one part of the Real Estate Broker Exam you are permitted to take and pass the subsequent part at a later date within six months. If you have not applied for your real estate license after one year of passing the exam you may be required to take an additional course. If you still have not applied after five years for a license you may be required to retake the exam. The Vermont Real Estate Broker exams are scheduled once a month. Results after the exam are sent by mail. The exam is closed book. The registration fee to take the Vermont Real Estate Broker exam is $55.00 whether you take one or both parts of the exam. The retake fee is $55.00 whether you take one or both parts of the exam.